The negative impact of heavy metals on the human and animal organism has been and continues to be demonstrated by 100's of articles published by The World Health Organization, research institutes, and other organizations. Institutions for sanitary issues consider that there are almost no more places in the world which are not affected by this problem. This is a major health challenge. The massive exposure to toxic agents has become a real public danger. Transported by pollution of the air, the earth and water (ground waters and sea water), heavy metals pollute the human body either directly by contact or indirectly through the food chain. The elimination of these toxic metals out of the human body by appropriate chelating agents, can detoxify the human body. This helps many health issues. Furthermore, scientific studies alert us of another problem. They point out the dramatic depletion of healthy nutrients in food, accompanied by an increase use of food additives and preservatives, which cause various health problems in the body. Any individualized detoxification supplementation favors the optimized functioning of the body; a main advantage to staying healthy. Spectrophotometry has many uses in industry and health care: chemistry, pharmacy, environment, food-processing and biology. It is used in medical, material and chemical engineering, and clinical applications. Spectometry is a quite accurate and inexpensive way to test. 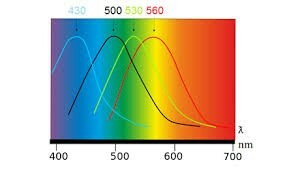 Spectometry is a quantitative analytical methodology, which consists of measuring the absorbance level or the optical density of a specific chemical or mineral substance. The more the sample is concentrated, the more it absorbs the light within the limits of proportionality expressed in the Beer-Lambert law. Why do I need this testing? Heavy metals are highly degenerative to the body. They are associated with Alzheimer disease and other memory issues. Comparative studies of Oligoscan test results with traditional biological analysis show a correlation with expected standards. Healthcare practitioners currently using the OligoScan report that 90% of their patients register highest in aluminum. In addition, 80% of their patients show excess heavy metals. Accumulation of these metals in the body reduces the effectiveness of medical and natural treatments up to 60%. We are exposed to these metals on a daily basis, so knowing how effective your body is at detoxifying them will allow you to improve that function if needed. How does Oligoscan compare to other toxicity tests? Blood tests show metals which have circulated recently. Metals are dumped within a few days from the blood stream into the tissues. The amount of minerals and trace elements is kept fairly constant in blood, so blood can only be used in acute situations to find toxic metals. Urinalysis shows to what extent the body can excrete metals. In normal spontaneous urine samples almost nothing is excreted. Only after the body is provoked are increased metal concentrations found in the urine. This is done with a challenge test for toxic metals. This is a valuable test to show the amount of metals present in the extracellular environment. Hair analysis shows which metals were present during the last 2-3 months. But, if a body cannot detoxify well, the amounts of metals found in hair will be low. This is called a false-negative result. Blood, urine or hair analysis take two weeks to obtain results, while Oligoscan provides IMMEDIATE RESULTS. 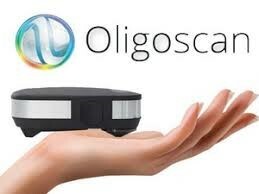 The actual measurement with the Oligoscan is very simple. After entering your data the Oligoscan Sensor is gently pressed on four points of the hand. The light beam will determine the intensity of the electromagnetic signals of 34 elements, convert to numbers and generate a report. Results are immediate, and evaluate the levels of 14 common heavy metals and 20 important minerals and trace minerals. In addition, this testing evaluates how well your body is able to eliminate heavy metals on its own, and whether nutritional support is needed in order to improve the elimination. The reporting also evaluates several key mineral ratios, including the sodium and potassium ratio crucial to cardiovascular health.